Buy your additional items here. Flashing badges and other novelty wear. 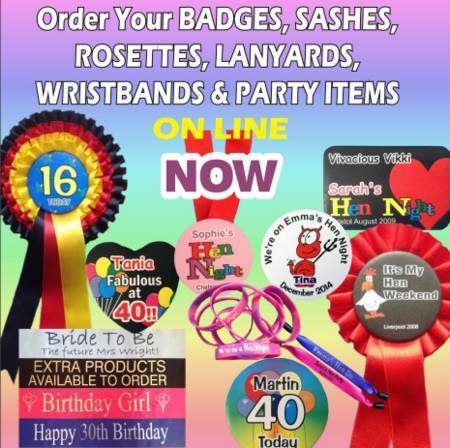 If you want any additional information on any of our products: rosettes, badges or printed sashes, before you order. Then use the links below which will give you additional information and further links. Alternatively, or in addition, you can also contact us by email or phone for advice or further details of any of our products. 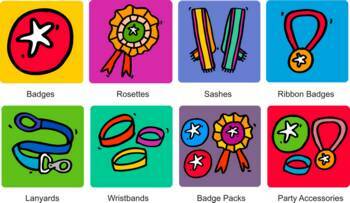 Our range of products for the party market includes Customised Rosettes, printed sashes and Personalised party badges. 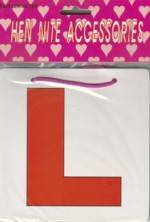 The products we supply are suitable for many occasions and not just the more popular hen nights and birthday parties. We produce all the badges, rosettes and sashes in house, so we have total control over the quality. It also means that we can usually amend our production to fit in any last minute orders. 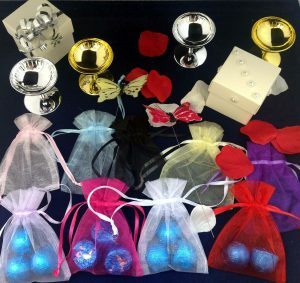 For the wedding, we have a few ideas for you, such as additions to your table display, including: table confetti, miniature champagne glasses, bows, fabric petals, butterflies for displays, and favour boxes and bags. If you prefer not to order using our on line forms then just send an email to sales@mypartywear.co.uk or phone us on 0845 519 1231 (including weekends) and we will send you a quotation. Once confirmed we can send you a payment link or take payment over the phone.